For other uses, see Particle (disambiguation). 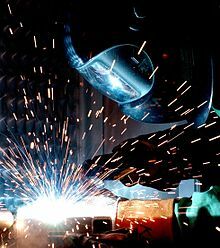 Arc welders need to protect themselves from welding sparks, which are heated metal particles which fly off the welding surface. In the physical sciences, a particle (or corpuscule in older texts) is a small localized object to which can be ascribed several physical or chemical properties such as volume, density or mass. They vary greatly in size or quantity, from subatomic particles like the electron, to microscopic particles like atoms and molecules, to macroscopic particles like powders and other granular materials. Particles can also be used to create scientific models of even larger objects depending on their density, such as humans moving in a crowd or celestial bodies in motion. The term 'particle' is rather general in meaning, and is refined as needed by various scientific fields. Something that is composed of particles may be referred to as being particulate. However, the noun 'particulate' is most frequently used to refer to pollutants in the Earth's atmosphere, which are a suspension of unconnected particles, rather than a connected particle aggregation. Particles are often represented as dots. This figure could represent the movement of atoms in a gas, people in crowds or stars in the night sky. The concept of particles is particularly useful when modelling nature, as the full treatment of many phenomena can be complex and also involve difficult computation. It can be used to make simplifying assumptions concerning the processes involved. Francis Sears and Mark Zemansky, in University Physics, give the example of calculating the landing location and speed of a baseball thrown in the air. They gradually strip the baseball of most of its properties, by first idealizing it as a rigid smooth sphere, then by neglecting rotation, buoyancy and friction, ultimately reducing the problem to the ballistics of a classical point particle. The treatment of large numbers of particles is the realm of statistical physics. The term "particle" is usually applied differently to three classes of sizes. The term macroscopic particle, usually refers to particles much larger than atoms and molecules. These are usually abstracted as point-like particles, even though they have volumes, shapes, structures, etc. 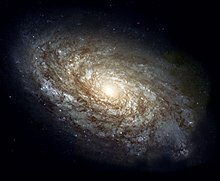 Examples of macroscopic particles would include powder, dust, sand, pieces of debris during a car accident, or even objects as big as the stars of a galaxy. Another type, microscopic particles usually refers to particles of sizes ranging from atoms to molecules, such as carbon dioxide, nanoparticles, and colloidal particles. These particles are studied in chemistry, as well as atomic and molecular physics. The smallest of particles are the subatomic particles, which refer to particles smaller than atoms. These would include particles such as the constituents of atoms – protons, neutrons, and electrons – as well as other types of particles which can only be produced in particle accelerators or cosmic rays. These particles are studied in particle physics. Because of their extremely small size, the study of microscopic and subatomic particles fall in the realm of quantum mechanics. They will exhibit phenomena demonstrated in the particle in a box model, including wave–particle duality, and whether particles can be considered distinct or identical is an important question in many situations. 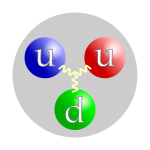 A proton is composed of three quarks. Particles can also be classified according to composition. Composite particles refer to particles that have composition – that is particles which are made of other particles. For example, a carbon-14 atom is made of six protons, eight neutrons, and six electrons. By contrast, elementary particles (also called fundamental particles) refer to particles that are not made of other particles. According to our current understanding of the world, only a very small number of these exist, such as leptons, quarks, and gluons. However it is possible that some of these might turn up to be composite particles after all, and merely appear to be elementary for the moment. While composite particles can very often be considered point-like, elementary particles are truly punctual. Both elementary (such as muons) and composite particles (such as uranium nuclei), are known to undergo particle decay. Those that do not are called stable particles, such as the electron or a helium-4 nucleus. The lifetime of stable particles can be either infinite or large enough to hinder attempts to observe such decays. In the latter case, those particles are called "observationally stable". In general, a particle decays from a high-energy state to a lower-energy state by emitting some form of radiation, such as the emission of photons. In computational physics, N-body simulations (also called N-particle G7 simulations) are simulations of dynamical systems of particles under the influence of certain conditions, such as being subject to gravity. These simulations are very common in cosmology and computational fluid dynamics. N refers to the number of particles considered. As simulations with higher N are more computationally intensive, systems with large numbers of actual particles will often be approximated to a smaller number of particles, and simulation algorithms need to be optimized through various methods. Colloidal particles are the components of a colloid. A colloid is a substance microscopically dispersed evenly throughout another substance. Such colloidal system can be solid, liquid, or gaseous; as well as continuous or dispersed. The dispersed-phase particles have a diameter of between approximately 5 and 200 nanometers. Soluble particles smaller than this will form a solution as opposed to a colloid. Colloidal systems (also called colloidal solutions or colloidal suspensions) are the subject of interface and colloid science. Suspended solids may be held in a liquid, while solid or liquid particles suspended in a gas together form an aerosol. Particles may also be suspended in the form of atmospheric particulate matter, which may constitute air pollution. Larger particles can similarly form marine debris or space debris. A conglomeration of discrete solid, macroscopic particles may be described as a granular material. ^ "Particle". AMS Glossary. American Meteorological Society. Retrieved 2015-04-12. ^ "Particle". Oxford English Dictionary (3rd ed.). Oxford University Press. September 2005. ^ T. W. Lambe; R. V. Whitman (1969). Soil Mechanics. John Wiley & Sons. p. 18. ISBN 978-0-471-51192-2. The word 'particulate' means 'of or pertaining to a system of particles'. ^ F. W. Sears; M. W. Zemansky (1964). "Equilibrium of a Particle". University Physics (3rd ed.). Addison-Wesley. pp. 26–27. LCCN 63015265. ^ F. W. Sears; M. W. Zemansky (1964). "Equilibrium of a Particle". University Physics (3rd ed.). Addison-Wesley. p. 27. LCCN 63015265. A body whose rotation is ignored as irrelevant is called a particle. A particle may be so small that it is an approximation to a point, or it may be of any size, provided that the action lines of all the forces acting on it intersect in one point. ^ F. Reif (1965). "Statistical Description of Systems of Particles". Fundamentals of Statistical and Thermal Physics. McGraw-Hill. pp. 47ff. ISBN 978-0-07-051800-1. ^ J. Dubinski (2003). "Galaxy Dynamics and Cosmology on Mckenzie". Canadian Institute for Theoretical Astrophysics. Retrieved 2011-02-24. ^ G. Coppola; F. La Barbera; M. Capaccioli (2009). "Sérsic galaxy with Sérsic halo models of early-type galaxies: A tool for N-body simulations". Publications of the Astronomical Society of the Pacific. 121 (879): 437. arXiv:0903.4758. Bibcode:2009PASP..121..437C. doi:10.1086/599288. ^ "Subatomic particle". YourDictionary.com. Archived from the original on 2011-03-05. Retrieved 2010-02-08. ^ R. Eisberg; R. Resnick (1985). "Solutions of Time-Independent Schroedinger Equations". Quantum Physics of Atoms, Molecules, Solids, Nuclei, Ions, Compounds and Particles (2nd ed.). John Wiley & Sons. pp. 214–226. ISBN 978-0-471-87373-0. ^ F. Reif (1965). "Quantum Statistics of Ideal Gases – Quantum States of a Single Particle". Fundamentals of Statistical and Thermal Physics. McGraw-Hill. pp. vii–x. ISBN 978-0-07-051800-1. ^ R. Eisberg; R. Resnick (1985). "Photons—Particlelike Properties of Radiation". Quantum Physics of Atoms, Molecules, Solids, Nuclei, and Particles (2nd ed.). John Wiley & Sons. pp. 26–54. ISBN 978-0-471-87373-0. ^ R. Eisberg; R. Resnick (1985). "de Broglie's Postulate—Wavelike Properties of Particles". Quantum Physics of Atoms, Molecules, Solids, Nuclei, and Particles (2nd ed.). John Wiley & Sons. pp. 55–84. ISBN 978-0-471-87373-0. ^ F. Reif (1965). "Quantum Statistics of Ideal Gases – Identical Particles and Symmetry Requirements". Fundamentals of Statistical and Thermal Dynamics. McGraw-Hill. pp. 331ff. ISBN 978-0-07-051800-1. ^ F. Reif (1965). "Quantum Statistics of Ideal Gases – Physical Implications of the Quantum-Mechanical Enumeration of States". Fundamentals of Statistical and Thermal Dynamics. McGraw-Hill. pp. 353–360. ISBN 978-0-07-051800-1. ^ "Composite particle". YourDictionary.com. Archived from the original on 2010-11-15. Retrieved 2010-02-08. ^ "Elementary particle". YourDictionary.com. Archived from the original on 2010-10-14. Retrieved 2010-02-08. ^ I. A. D'Souza; C. S. Kalman (1992). Preons: Models of Leptons, Quarks and Gauge Bosons as Composite Objects. World Scientific. ISBN 978-981-02-1019-9. ^ US National Research Council (1990). "What is an elementary particle?". Elementary-Particle Physics. US National Research Council. p. 19. ISBN 0-309-03576-7. ^ a b A. Graps (20 March 2000). "N-Body / Particle Simulation Methods". Retrieved 2019-04-18. ^ "Colloid". Encyclopædia Britannica. 1 July 2014. Retrieved 2015-04-12. ^ I. N. Levine (2001). Physical Chemistry (5th ed.). McGraw-Hill. p. 955. ISBN 978-0-07-231808-1. "What is a particle?". University of Florida, Particle Engineering Research Center. 23 July 2010. D. J. Griffiths (2008). Introduction to Particle Physics (2nd ed.). Wiley-VCH. ISBN 978-3-527-40601-2. M. Alonso; E. J. Finn (1967). "Dynamics of a particle". Fundamental University Physics, Volume 1. Addison-Wesley. LCCN 66010828. M. Alonso; E. J. Finn (1967). "Dynamics of a system of particles". Fundamental University Physics, Volume 1. Addison-Wesley. LCCN 66010828. S. Segal (n.d.). "What is a Particle? - Definition & Theory". High School Chemistry: Help and Review. Study.com. Chapter 4, Lesson 6. "A basic guide to particle characterization" (PDF). Malvern Instruments. 2015. This page was last edited on 20 April 2019, at 20:07 (UTC).